Kate Schnake devotes her practice to representing and advising lawyers and law firms on all aspects of the laws governing lawyers. Her professional liability defense experience includes defending lawyers and law firms against actions for civil liability and professional ethics and responsibility. Kate is a former adjunct professor at The John Marshall Law School. 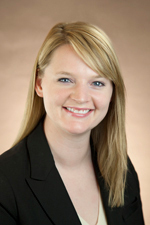 Prior to joining Hinshaw as an attorney, she was a summer associate with the firm, as well as a paralegal. During law school, Kate was a member of the Dean's List, and was a teaching assistant for a first-year torts course. Kate has run the Chicago marathon three times in support of St. Jude Children's Research Hospital and the Diabetes Action Team. She is also an active member of the equestrian world and has a passion for all things horse-related. As an undergraduate at Millikin, Kate was a member of the varsity women's volleyball team and served as team co-captain from 2005 to 2006.